I would have never dreamt after wandering into Portland Films on Shaftesbury Avenue London so long ago to collect my Super 8 400ft 3D sound film of Mad Magician I would be watching a 3D hi-def resto of the full feature on my home cinema screen years later for sure. So much of the golden era 50's 3D material is now available and of course these were the real 3D films for me, shot with film and by various systems sometime dragged out of moth balls to film with. Some films such as Cease Fire were filmed in 3D but never screened in the format and only available to see them now as they were intended to be watched. Pretty mind blowing..
We have great affection for A*P*E which is really a shocker but so bad its good. This Korean 1976 ape 3D film is worth having if only for being so unbelievable but it sure is fun. Talking about 3-D here is a 3-D Festival for Short Films in Super 8 or Digital here in the Land Down Under. 3-D Entries & Show and Tell also Welcome. Glasses Provided on the day, or you can BYO Glasses. Also a Discussion, on Different Types of 3-D in Film & Digital Cameras and Projectors. Or if you would like to write or send in a 3-D Entry to: P.O. Box 92 Glenroy, Melbourne, VIC, 3046. Could you get back here later after your event with some photos and information of the 3D presentation on both digital and Super 8...? I am about a 4 hour drive away but I am happy to Promote and Assist Ed's 3-D Event. Last night it was the turn of Jumanji "Welcome to the Jungle" in 3D, and its absolutely stunning. A while ago we watched the 2D version and really enjoyed the movie, but the 3D takes it to a whole new level. The conversion to 3D is perfect from start to finish. The movie is a real fun ride. The casting is perfect and I understand all four actors are returning for another. On the front cover it states "hilarious and packs a punch" well that pretty sums up the movie.....brilliant stuff, highly recommend it especially in 3D. Lee, you have very good taste! Our latest release is JIVARO, which was seen flat only in 1954! However Internet Explorer cant find it. I highly recommend our 3-D RARITIES release through Flicker Alley. It's region free too! The very best to you and the team. I checked out your trl for "3D Rarities" and it looks great, I hope to buy a copy soon, on condition my financial advisor "the wife" gives me the OK. Anyone want to go to Mars?...well if you can't afford the trip, watching the 3D Blu-ray is the next best thing. Unlike many movies these days, this one takes its time, giving one the chance to view the Martian surface in 3D, which I should add looks great. 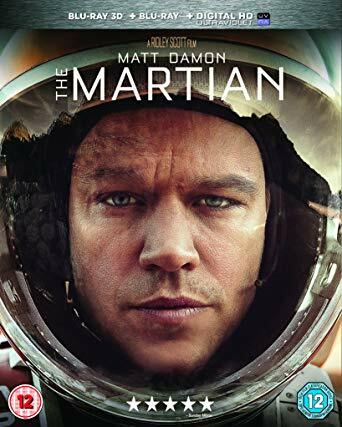 "The Martian" is a good story of survival, so if you enjoy watching 3D at a slower pace, then I would add this one to my list.....its really good.